The country's ban on any garment "that hides the face in public" came into force on 1 August. 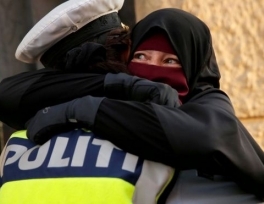 It does not specifically mention Muslim women, but it makes wearing a face veil an offence punishable by a fine of 1,000 kroner (£120; $158), rising ten times higher for repeat offenders. Marcus Knuth, a member of the Venstre party, sent a complaint to the police after reportedly seeing a press release about the two women. 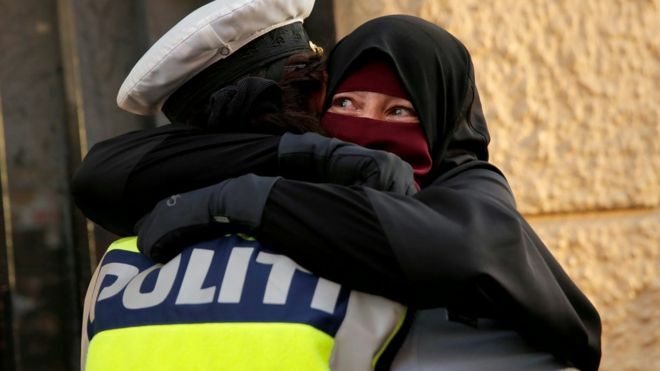 Danish newspaper BT reports that Mr Knuth's complaint says the officer's actions could suggest "the police in Denmark sympathise more with niqab demonstrators than with [government] legislation". "The police must never become a volunteer or involuntary actor in a political debate," Mr Knuth told public service broadcaster DR. But the policewoman's lawyer, Torben Koch, told Reuters news agency she felt she had acted appropriately that day in her role as a "dialogue officer" - on-duty police who serve to ease tensions during protests. "It is complete nonsense," Mr Koch said. "As my client said, if it had been any other person in the same situation she would have done the same, so it has nothing to do with her wearing the niqab." France was the first European country to ban the full-face veil in public places in April 2011, followed a few months later by Belgium. The European Court of Human Rights ruled in 2017 that the Belgian ban does not violate the European Convention on Human Rights. Full or partial bans have since been passed in Austria and Bulgaria. The southern German state of Bavaria also has a ban. The Dutch parliament agreed a ban in late 2016, pending approval from the country's higher chamber.